If your background thus far has been mostly limited to your home state, you’re not ready for the onslaught of impertinent, annoying questions about your policy towards Durkadurkastan. In a panic you start to study. But there are so many damned Stans! And then people want to know whether your tax-policy numbers add up, the bastards. And you’re expected to know stuff like how the alternative minimum tax works. And where all of America’s troops are. And then the snivelling reporter from the Globe and Mail asks a question to tease out whether you know what the prime minister of Canada’s name is—you’re sure it’s something really ordinary, but is it Stephen Parker or Ben Harper or Michel Carter or what? Then you have to study all your rivals and what they’re saying and doing, too. You have to study fast, and you’re travelling all the time, and still kissing babies and begging for money over the phone. You eat fried garbage at state fairs and diners, and barely sleep. Now you probably get nervous, then tense; swagger won’t turn the dynamic around. A few gaffes and you tense up more. You study harder, but there’s just so much stuff to learn! And they they start digging through your past; why oh why didn’t you anticipate that story getting out? Nobody told you it was going to be like this! My guess: Perry’s political life in Texas has just been too easy. 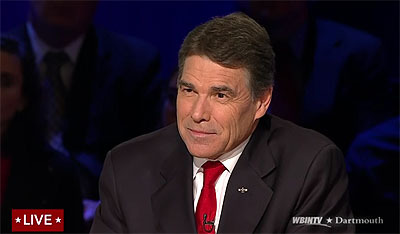 His competition has been weak and his more-Texas-than-thou persona, along with some smart consultants, has been enough. He didn’t need to know anything. But on the national stage — even the GOP version of it — you do. And he simply had no idea just how tough it was going to be. As near as I can tell, he still hasn’t figured it out.